Nancy Kitchen Towel - Red  - $8.20 : Yarn Tree, Your wholesale source for cross stitch supplies. Item 7824. 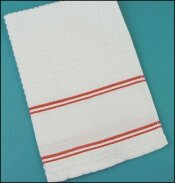 Nancy Kitchen Towel white with red trim. Nubby popcorn terry kitchen towels are brightly accented with a double stripe of color above and below the stitching area. Towels measure 15” x 24”. 100% cotton. 14ct design area is 2¾” x 14½”.